Nationally, 44 Greens were elected, bringing the total number of Green officeholders to 137. In addition, despite 2016 having the lowest number of enrolled Greens in 15 years, 2017 experienced a 19 percent increase of registered Greens with a total of 257,389. This makes the Green Party of the United States the fourth-largest party in the country, and the largest that doesn’t accept corporate money. Green Party of Utah gains ballot access: On September 18, the Green Party of Utah received notification from the Lieutenant Governor’s office that it had met the 2,000 signature threshold to gain ballot access as a political party in Utah. This allows for Green Party candidates to appear on ballots in 2018/2020, and voters will be able to register to vote as Green beginning November 30. On June 10 in El Paso, Texas, Alexsandra Annello won a City Council seat in District 2. Although it was a non-partisan election, Annello was endorsed by the El Paso County Green Party. On June 30 the Minneapolis city council voted to accelerate the phase-in of the $15/hour minimum wage. While council member Cam Gordon (G) argued for a faster phase-in for large companies, he reluctantly supported the five-year phase-in that the majority of council supported. The Georgia Green Party has posted an online interview with Dr. Margaret Flowers on single payer healthcare. 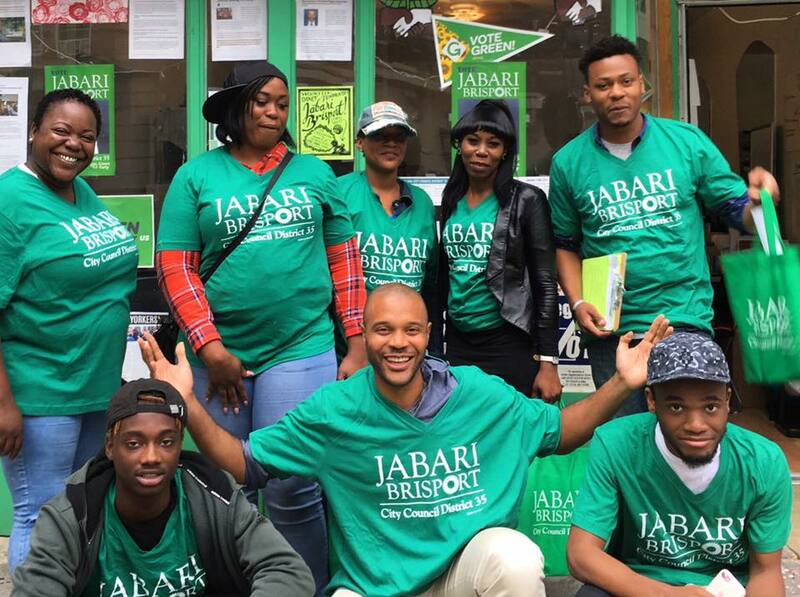 In New York, Jabari Brisport ran an inspiring campaign for City Council in Brooklyn, receiving 29 percent of the vote and demonstrating a Red-Green Alliance for Greens and Socialists around the US! In Glens Falls, Robin Barkenhagen received 35 percent of the vote for Councilor-At-Large, riding a swell of community support that we know will only grow with him in the fights ahead. In Syracuse, first-time candidates Eric Graf and Serena Seals broke into double-digits, representing movements for Socialism and Black Lives Matter. The Green Party of California and the Green Party of Los Angeles County have endorsed the Initiative to Repeal The Top Two Candidates Open Primary Law, a ballot measure that would overturn Top Two elections in California. “Californians deserve more choice in elections, not less,” said Michael Feinstein, former Green Mayor of Santa Monica and co-founder of GPCA. “Top Two elections undermine democracy by limiting voters to only two general election choices, while driving up the cost of running for office and making ballot access more difficult.” Organized efforts are underway to gather the needed 365,880 signatures to place it on the November 2018 ballot. The Green Party of Pennsylvania is celebrating several election victories for 2017. Out of ten candidates running, six were elected to office. Jules Mermelstein, statewide candidate for PA Superior Court Judge, was not one of those elected. However his strong showing was a victory in its own right, ensuring minor party status for GPPA for two more years. His vote count of 106,131 was more than eight times the number of registered Greens in the state. Mermelstein needed to get 2 percent of the number of votes received by the winner with the highest vote total in order for the Green Party to keep minor party designation in PA, and he achieved over 9 percent statewide. In Tacoma, WA the jury trial of two grandmothers who, with others including two Green Party Tahoma members, had locked themselves to the auger at the un-permitted but under-construction LNG plant in May, finally began on December 11. The defense attorney was allowed to present only one witness, a revered elder of the Puyal­lup Tribe. As it happens, the jury decided the case on the basis of her testimony. The many counts against our two heroines fell under two charges: Trespassing and Obstruction of Police. On the first, defendents were found Not Guilty; on the second, as Tacoma Police had no jurisdiction on tribal lands, they were declared Not Guilty and were free and clear of all charges. Making history in the Canadian province of Prince Edward Island, voters in the riding of Charlottetown-Parkdale elected Green Party of Prince Edward Island candidate Hannah Bell in the November 27 provincial by-election, garnering a hugely impressive 35.4 percent of the popular vote, beating the governing Liberal Party by 7.2 percent. Remarkably, the Greens won ten of the 11 polls as voters sent Bell to the PEI legislature. She becomes the first female Green Party member east of British Columbia to win a seat in a Canadian provincial legislature. The PEI Greens now have two seats, as leader Peter Bevan-Baker won the riding of Kellys Cross-Cumberland in the 2015 provincial general election. There are now six elected Green Party members in Canadian provincial legislatures.